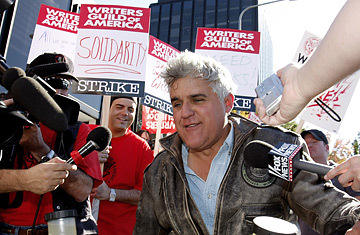 The Tonight Show talk show host Jay Leno greets supporters of the Writers Guild of America (WGA) and others on the picket line in front of Universal Studios in Universal City, Calif. The strike Jokes, at least, have died down. David Letterman  back on the air with his writers after making a separate deal with the Writers Guild  has moved on to wisecracks about the Cloverfield monster and Fed Chairman Ben Bernanke. Jay Leno, who has returned sans scribes but is supposedly writing the monologues himself (angering the Guild, which claims he's violating strike rules by doing so), is pummeling viewers with the usual rat-a-tat of gags playing off the headlines, from the presidential primaries to funny animal news. The three-month-old strike has sidelined more than 12,000 writers  writers of prime-time shows you can't live without, movies you haven't heard of yet and soap operas you're pretty sure are recycling story lines from 10 years ago. But it's the late-night hosts who have been in the most visible, and delicate, position. Leno and Letterman are both former stand-up comics and Guild members themselves, who supported their fellow union members for weeks, refusing to do their shows until the prospect of laying off all their nonstriking staff members forced them into an uneasy accommodation to get back on the air. Their conflicted roles in the current strike hark back to a less well remembered labor battle of nearly three decades ago. Letterman and Leno were key figures in one of the strangest and bitterest labor-management disputes in show-business history: the Comedy Store strike of 1979. That walkout was the culmination of a decade in which stand-up became the voice of the counterculture generation. Like George Carlin, Richard Pryor and other pioneers of those years, the new stand-up comics were not just anti-Establishment rabble rousers; they were intimate, populist artists who got their power by convincing us that they were ordinary folks, with the same gripes and anxieties as everyone else. They joked about furnishing their tiny apartments and riding the subways and trying to get girls. The strike against the Comedy Store, the leading comedy club in Los Angeles, reinforced their real-life status as working-class crusaders. For both Leno, who ostentatiously took doughnuts to the picketing writers on the first day of the current strike, and Letterman, who more quietly assured his staff that he would pay their salaries in the weeks the show was dark, the first strike was a cautionary  and formative  experience. The issues and adversaries were much different from today's, but the dispute was perhaps more rancorous. In the 1970s, the stucco box on Sunset Boulevard that housed the Comedy Store was a nightly practice field for up-and-coming comics who would troop onstage to hone their material, try out new jokes  and hope to get seen by the agents, managers and talent scouts who were regular clubgoers. The club's owner, Mitzi Shore  a pretty, petite brunet with a whiny, Roseanne-like voice who had inherited the Comedy Store in a divorce from comedian Sammy Shore  viewed the place not as a traditional nightclub but as a "college" of comedy where newcomers could learn their craft and grow as artists. And so she didn't feel the need to pay them anything. The comics put up with this for years. For one thing, they felt they were getting as much out of the club as Shore was out of them. She had helped many of them by lending them money, even giving some places to stay. Plus, no one wanted to antagonize the woman who was the gatekeeper for their show-biz dreams. But after Shore opened a second, larger showroom at her club, where she paid big-time headliners  but not the younger comics who also appeared there  the comedians rebelled. A labor movement was born. The issue wasn't today's relatively abstruse one of payments for DVDS or Internet downloads; it was simply getting paid. Tom Dreesen, a comedian and former Teamster from Chicago who became a spokesman for the comics, pleaded with Shore to give them at least a token amount. "I told Mitzi, 'You pay the waiters, you pay the waitresses, you pay the guy who cleans the toilets. Why don't you at least pay the comedians?'" says Dreesen. Many of the struggling kids who were helping her club thrive, he pointed out, couldn't even afford to buy groceries. On New Year's Eve, he had run into one of them, on a high after finishing a set. "He said, 'It was fantastic. I killed 'em.' And then he said, 'Tom, can you loan me $5 for breakfast?' I told Mitzi that story, and she said, 'Well, he should get a goddam job.' I said, 'Mitzi, he has a job. He worked for you on New Year's Eve.'"